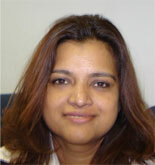 Smita is a Senior Lecturer in the Department of Electrical Engineering at Polytechnic of Namibia, Namibia. She is the coordinator of The Namibian Institue of Space Technology(NIST) in Namibia. She is also the chairman of the Women in Engineering society and the recipient of the Sam Nujoma National Award for her outstanding work in capacity building .